14. Angelos P. Matthaiou: Angelos P. Matthaiou was born in Athens in 1954 and studied History and Archaeology at the University of Athens. Among his teachers were Nikolaos M. Kondoleon (1910-1975) in Classical Archaeology and Aristoxenos D. Skiadas (1932-1994) in Ancient Greek Philology. Between 1972 and 1978 he was a student of Stephanos N. Koumanoudes (1931-1987) who introduced him to the study of Ancient Greek inscriptions and Attic Topography. These are the two areas of study which are the focus of his interest. He is one of the founding members of the Greek Epigraphic Society. In 1983 he founded together with Yanis A. Pikoulas and Aris N. Tsaravopoulos ΗΟΡΟΣ Journal. 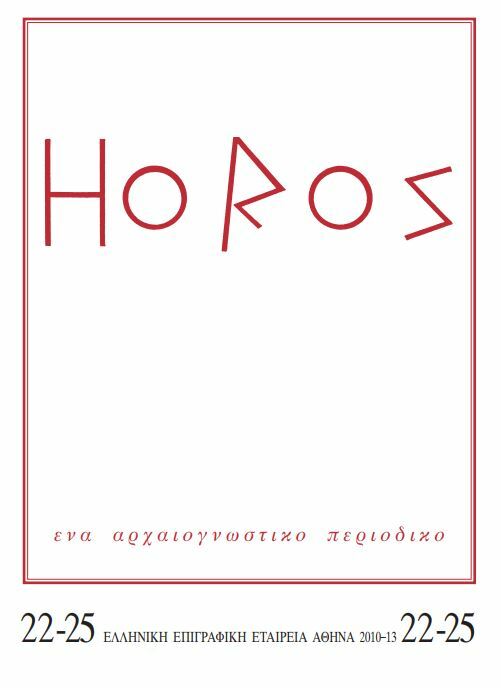 Since then he has been Editor of HOPOΣ and responsible for the epigraphic articles and those on Attic Topography. 17. Voula N. Bardani: Voula N. Bardani is editor of the Horos journal. She studied Greek Epigraphy under Stephanos Koumanoudes and Angelos P. Matthaiou. Since 1987 she has been collaborating with Prof. P. Themelis in the excavation project of Ancient Messene as an epigraphist responsible for the study and publication of inscriptions. During the period 1990-2002 she worked as a researcher at the Archaeological Society at Athens in the projects of the Archive of the Monuments of Athens and Attica (ARMA) and the Corpus of the Funerary Inscriptions of Attica (SEMA). She is currently curator of Antiquities at the Ephorate of Antiquities of Athens. She is co-editor with Stephen V. Tracy of the corpus of Inscriptiones Atticae Euclidis anno posteriores. Ed. tertia. Pars I: Fasc. 5: Leges et decreta annorum 229/8-168/7 inscriptions (IG II/III³, 1, 5; Berlin 2012). 21. Yanis A. Pikoulas: Prof. Dr Yanis Pikoulas was born at Athens (1956). Professor of Ancient Greek History at the Department of History, Archaeology, Social Anthropology (HASA), University of Thessaly, Volos, 2001ff. Associate Researh Professor at KERA – NHRF (= Research Centre for Greek and Roman Antiquity – National Hellenic Research Foundation) 1996-2001. His interests are Topography (Peloponnesus, Macedonia, Cyclades, Thessaly), Epigraphy and Ancient Economy (Olive & Wine production etc.). He has been studing since `80s the ancient Greek road-system. He carried out Surveys at Peloponnesus (Arcadia, Argolid-Corinthia, Laconia), Thessaly and Macedonia – Thrace. 4. Maria Diakoumakou (16.12.1989): Maria Diakoumakou is employed as a philologist in the Greek state high school education system. Since 2006 she is working in collaboration with A. Makres on the study and publication of the inscriptions kept in the Archaeological Museum of Messenia in Kalamata. 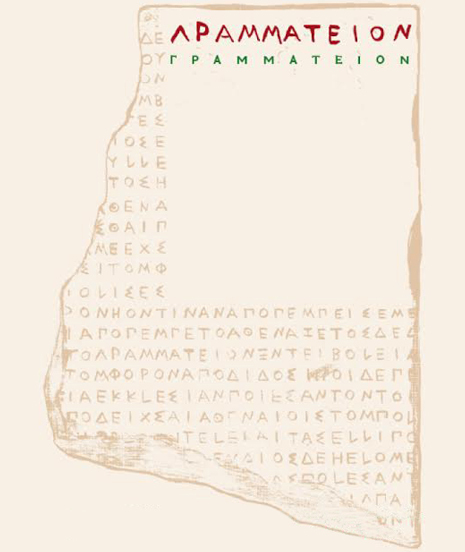 She has compiled a Catalogue of the inscriptions published in the Αρχαιολογικόν Δελτίον of the years 1915-1935, for the project of the Archive of Ancient Monuments in Athens and Attica (ARMA) of the Archaeological Society at Athens (2002-04). She was a member of the team of researchers who worked on the Catalogue of the inscriptions of the Akropolis of Athens(1990-2). She attended the seminars on Ancient Greek Epigraphy and Topography in Athens held by Angelos Matthaiou (1986-1988). She is a member of the Greek Epigraphic Society since 1989. 7. Georgia E. Malouchou (16.12.1989): Georgia Malouchou has been working since 1990 as a researcher in the project Archive of the Monuments of Athens and Attica (ARMA) at the Archaeological Society at Athens. Her major interests are Attic and Chian epigraphy, and the topography of ancient Athens and Attica. She collaborates on IG XII 6.3 (Chios). 8. Sophia Alipheri (15.12.1991): Sofia D. Aliferi obtained a BA in Classical Archaeology and an MA in Museum Studies from the University of London. Between 1990 and 1999, she worked as a researcher at the Archaeological Society at Athens compiling catalogues of inscriptions for the areas of the Marathonian Tetrapolis and Laurion (Lavreotiki). Aliferi also worked in the monumental project of cataloguing all the sculptures and inscriptions (λίθινα) of the National Archaeological Museum, a project which involved also extensive research into old archives of the Archaeological Society as well as research into old and recent bibliography. The data bases of this project include the recording of more than 12.000 monuments and a lot of particularly valuable information on find spots and unknown archaeological finds. From 2000 to 2003 Aliferi worked in the Archive of Attic Inscriptions organizing its library and archival material. Since 2003 she is working together with Dr. G. Steinhauer in the New Edition of Post-Eucleideian Attic Inscriptions (IG II³), editing the Attic deme, phylai, gene and phratry decrees. For many years she has worked with old and new material on the history and topography of the Demosion Sema. She has been a member of the Greek Epigraphic Society since 1989. 10. Georgios Papadopoulos (15.12.1991): George K. Papadopoulos has been working since 1994 as a researcher at the Archaeological Society at Athens. His research focuses on the Attic funerary monuments and the cults of ancient Athens and Attica. He is also interested in Attic epigraphy and topography and inscriptions of ancient Salamis, Paros and Ikaria. 13. Yannis Kalliontzis (5.1.2011): Yannis Kalliontzis has studied archaeology at the National University of Athens and ancient history at the University of Paris IV-Sorbonne where he acquired a Masters degree with a dissertation on inscriptions from Chaeronea and Orchomenos. He has studied epigraphy under A.P. Matthaiou in the seminars of the Greek Epigraphic Society from 1999 to 2003. He is currently completing his thesis on the epigraphy and history of Hellenistic Beotia under the supervision of Profs D. Knoepfler and Fr. Lefèvre. He is also working as an assistant in the Collège de France, Chaire d’épigraphie et d’histoire des cités grecques (Prof. D. Knoepfler). 18. Robert Pitt (5.1.2011): Robert Pitt has been Assistant Director of the British School at Athens since 2007. While a student at the Univeristy of London, he was introduced to epigraphic fieldwork during several tours of Turkey with Michael Crawford and Joyce Reynolds. His main interest is in Greek law, and in particular the inscribed building accounts, regulations, and contracts associated with large public construction works in the Classical and Hellenistic periods. He is currently writing a book on the building contracts from the temple of Zeus Basileus at Lebadeia in Boeotia, a source book on the building inscriptions of the Periclean Acropolis, and is co-editing with Angelos Matthaiou the proceedings of a conference on the Athenian Empire in honour of Harold Mattingly.